I am such a fruit addict! I know that eating a lot of fruit isn't good for you but I love it so i dont really care. I would rather eat a peach than candy so i think i am making wise life choices. Okay now that that is out of the way... One of my favorite things to do is make popsicles (ice lollies) in the summer and they are super easy and fast(ish). 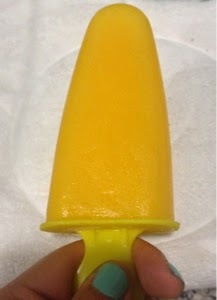 My first flavors were Mango (pic 1) and Mango-Watermelon (pic 2). Both flavors were delicious. 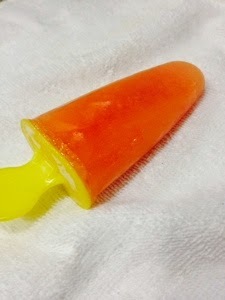 I will keep updating with new flavors throughout summer. For the mango: blend freshly cut mango and a bit of water till smooth. For the mango-watermelon: 1. blend cut watermelon until it becomes juice, 2. cut up a fresh mango and add it to the blender, 3. add watermelon juice instead of water, 4. blend until smooth. -Add to your molds and freeze for a few hours (3-4 at the very least).